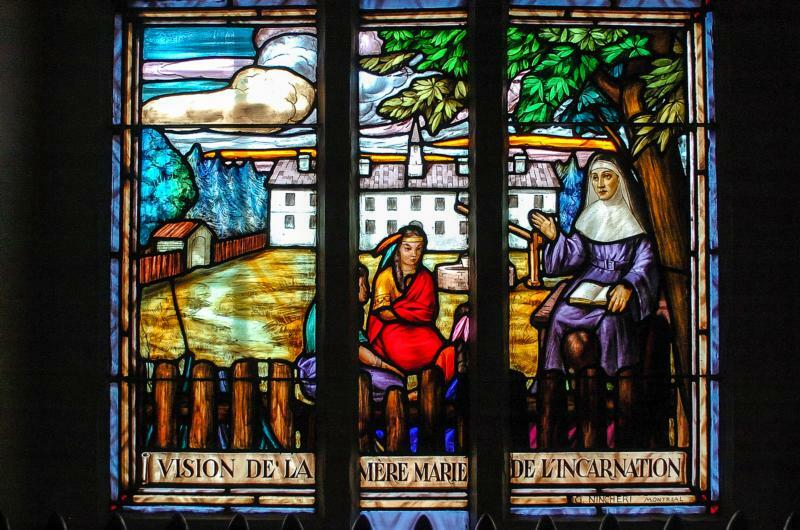 QUEBEC CITY (CNS) — St. Marie of the Incarnation, a French Ursuline nun sent to establish the order in New France in the 17th century, has not yet delivered all her secrets. Beginning this fall, the must-see figure in Quebec will be the subject of a forensic investigation with scientific and theological implications. The roots of the investigation began with a visit to the Ursulines in the Old Quebec and an unusual object attracted the attention of Laval University professor Philippe Roy-Lysencourt: the saint’s death mask. It got him thinking that perhaps more could be learned about the revered Ursuline nun. Step back a few months to fall 2017. Roy-Lysencourt, a historian and assistant professor of theology and religious studies, coordinated a pathography conference with Philippe Charlier, a French pathologist known for his study of the remains of famous people including King Richard the Lionheart and King Henri IV of France. Charlier presented a digital reconstruction of Mary Magdalene at the conference. Pathography is a relatively new branch of paleopathology and involves the medical study of people about whom history has hidden details about their life and death, including their physical appearance. The discipline aims to separate myth from reality by using scientific analysis of a person’s remains to validate — or invalidate — the story behind their life. He submitted a proposal to the Ursulines to secure their permission to continue. He’ll count on Charlier among his collaborators. Roy-Lysencourt proposed not only analyzing the mask, but also of the ulna from the saint’s forearm from her remains at the Ursuline motherhouse. He also wants to examine the skull of the founder of the Canadian Ursulines, who died in 1672, to reconstruct her face as faithfully as possible. However, the investigation could be more difficult than expected, because the saint’s skull is nowhere to be found. Her body has been exhumed six times over the centuries, and in various reports there is no trace of the skull. Two main hypotheses offer an explanation: Either the skull quickly decomposed, or it was taken and offered to someone soon after her death, as was often done in the 17th century. It could have been sent to Tours, France, where Marie Guyart, the saint’s given name, was born in 1599. Or it could have been sent to the Congregation of Saint-Maur, to which her son, Dom Claude Martin, belonged. Either are plausible, but after going through the Ursuline archives Roy-Lysencourt said he thinks it simply decomposed. Nevertheless, the historian planned to travel to Tours this summer to continue his investigation in the places where the saint lived the first 40 years of her life. The study should cost about $7,800 and the scientists involved agreed to work for free. It could take up to 18 months to get the first results. But convincing the Ursulines to endorse the project has been more difficult than expected. In the four years since St. Marie of the Incarnation’s canonization, Sister Dionne said she saw a greater dissemination of their founder’s writings throughout the world. For her, having people get in touch with her spirituality and making sure her mission continues is more important. Still, the Ursulines do recognize the value of such research. “Marie of the Incarnation could make its way into the scientific world, where she is less known. If it can expand her influence around the world, she would have said yes,” Sister Dionne said. Raymond Brodeur, scientific director of the Marie-de-l’Incarnation Study Center, also recognizes that such an exercise can trigger the curiosity of people and historians. “At the level of a popular devotion, which is a reality that is not to be neglected, it concretizes the relationship to a saint. We touch a part of her body. On a scientific level, it’s interesting to see how far they can go,” he said. Brodeur is one of the foremost specialists of the saint’s writings and spirituality. He recalled that she suffered from physical pain throughout her life. “Some have said that the symptoms she describes are very similar to what is called gout,” he said. He said he believes that learning more about the life and illnesses of St. Marie of the Incarnation could allow scholars to better understand her spiritual sensibilities. “For sure, a disease also works on a person’s stance, choices, and spirituality, as well as life choices,” added Brodeur, a retired theologian from Laval University. As for Roy-Lysencourt, he claimed that his quest is mostly scientific and that the meaning of such an investigation is to be found afterwards. It may get a boost from an international conference on the saint planned for this fall in Quebec City.